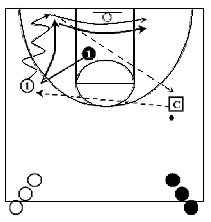 As a coach we often try several types of defense but our basic defense remains man-to-man. Our athletes must have good individual defensive skills; therefore, it is important that we work extensively on man-to-man coverage. 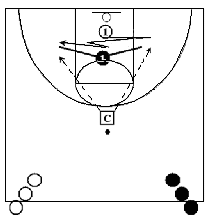 These drills will help your players improve their man-to-man defense skills! Defense is a challenge. Offensive players know their moves. It takes smarter players to play defense because they must be able to react and anticipate the offensive opponent's moves. A good defense means more ball possessions, which should translate into more points. Any good player can play defense if they concentrate. A good solid player will accept the challenge of playing defense. Defense takes more determination and how well your team defends will be a direct reflection of the maturity of those individuals and the team as a whole. Coaches must practice defensive drills at game tempo so their players are able to react and perform well during the game when they are called upon to improvise. There are three basic principles necessary to have a good defensive team. They are: 1) the ability to control the tempo, 2) solid basket protection and 3) shot selection with good execution and patience. Focusing on basics defensive fundamentals such as: the defensive stance, on the ball defense skills, timing as well as space and distance will improve your players' ability to defend under game conditions. Reminding your players to use the proper defensive stance is easy. Actually getting them in the stance will take practice. Players must practice the stance - feet should be spread about a shoulder width apart with their knees pointed slightly outward and their weight distributed on the inside of the foot. The trunk of the body is almost straight and the player's arms are to the side of the body with palms or thumbs up. A good defensive player will keep his feet moving and will make sure he always keeps his eyes on his opponent and ball. When guarding the player with the ball, the defensive player must be low in a good defensive stance and about an arms length away from their opponent. Under these circumstances the defensive player should focus on their opponent's trunk, so as not to be faked out of position. The defensive player must anticipate the dribble and maintain a defensive cushion of at least a step. If the dribbler gets ahead of the defense the defender should turn and run, using a cross-over step to get back in position and influence the dribbler to take the sideline or baseline. The defender should continue to pressure the ball and work the dribbler back to the middle of the floor where help awaits. When the defender forces the dribbler to pick up the ball, he should close up or "belly up", on the player and try to prevent a good pass. Now the defensive player should be in a parallel stance with both arms extended as high as possible to force the lob pass. The defender that is one pass away from the ball must constantly work to prevent his player from receiving the ball or cutting toward the basket for the shot. When the defender is one pass away from the ball he should place himself between his opponent and the basket. He should be at least one arm's length away and make sure one hand and foot are in the passing lane at all times. The defensive player must continually adjust his stance as his opponent moves or the ball moves so that he maintains the defensive triangle. 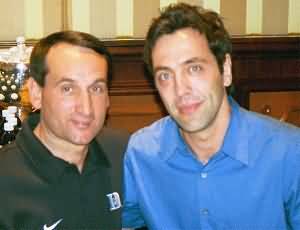 A simple rule is - the further the offensive player is from the ball the farther the defender can be from the offensive player he is guarding. The defender should take one step toward the ball with each pass going away from his man. However, the defender should never be so far away that he cannot beat the pass back to his man. The defender can open up to the ball a little more so he can see both his opponent and the ball as it moves away from him. The defensive players must continually readjust as the ball is passed and dribbled. The defender must not lose sight of the ball; therefore, it is important to make contact with the opponent so that he knows were the opponent is at all times. The defender is in the middle of lane on defense. 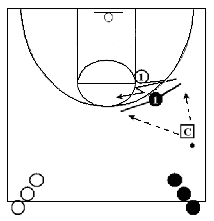 Offense starts in the wing away from ball on the weakside. Offense moves up to the free throw line extended to make defense move. Note: Point to the man and the ball. Aggressively deny the passing lane. When the offensive player cuts to the ball the defender should beat him to the spot and dictate directions on cuts. Do not give the cutter any options. 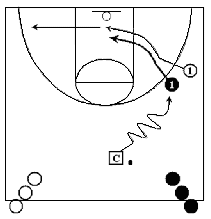 Offense cuts back door then posts up on the block. 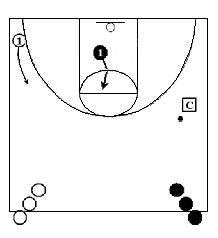 The defense plays back door cut then must front the post on the ball side. The offense player pops out to the corner and the defender maintains a pass denial position with his arm and hand in the passing lane. 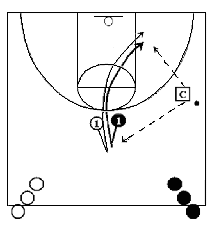 The offensive player cuts back door, then clears out to the weakside. 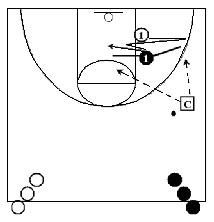 The defender assumes a pass denial position in the middle of the key. See man and the ball. Note: Do not follow the cutter to the weakside. 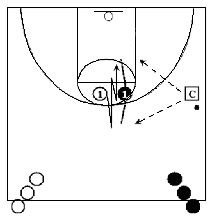 Offensive player starts in the corner away from ball on the weakside, and then attempts to flash to the ball. The defender is in the middle of the lane in the stance position on the line and up the line. See man and the ball. The defender must move and adjust to prevent the cutter from receiving the ball from the Coach. Defense assumes a pass denial against offense at the elbow. Offense steps out to top of the circle and then cuts to the weakside. 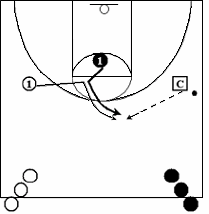 Defense stays on the line and up the line assuming a pass denial position in the middle of the key. 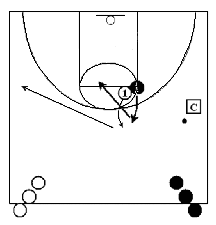 Offense player starts at wing away from ball on the weakside, and then attempts to cut to the ballside low post. The defender is in the middle of the lane in the stance position on the line and up the line. See man and the ball. The defender must move and adjust to prevent the cutter from receiving the ball from the Coach. 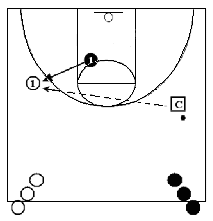 Offense starts at the ballside block crossing to the opposite wing to receive the skip pass from the Coach. Defense assumes a denial position then closes out with a high hand close enough to influence and contain any drive to the baseline and stop any shot. 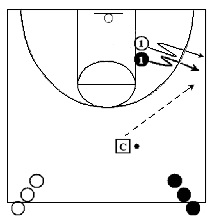 Offense passes to the Coach then cuts away to the weakside wing. The defender moves in the direction of the pass, and assumes a helpside position. See man and the ball. Defender is in a helpside position, seeing both the ball and player. 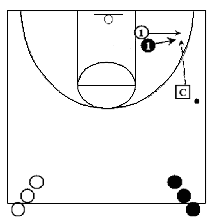 The Coach makes a skip pass to the offense player who looks to shoot or drive. Defender closes out on the offense player with a high hand close enough to prevent a shot. Defender is forcing the ball to the corner. 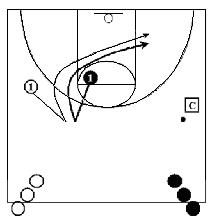 Purpose: To improve defender's help-side defense by recovering quickly. 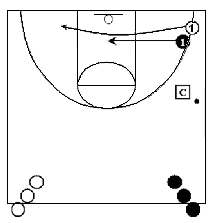 To close out the shooter and react to dribble penetration. 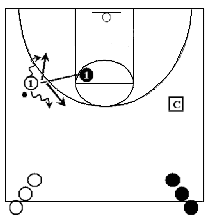 The Coach passes the ball to the offense player at the wing. Defender should protect the elbow. When the ball is on the wing, the defender should make every attempt to push the ball towards the baseline. When the dibbler tries to drive into the middle of the court, the defender should protect the elbow and force the dribbler over the top of the circle. 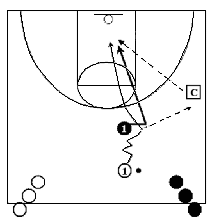 Offensive player makes a skip pass to the Coach and cuts to the ballside block. Defender should have his arm and hand in the passing lane to deny any return passes from the Coach to the offense player. Offense player steps out to the wing to receive the ball from the Coach. Defender stays in the pass denial position with his arm and hand in the passing lane. Offensive player goes back door cut to the basket trying to receive the pass from the Coach for the layup. Defender stays in a pass denial position and swivels his head for vision and slides down the key with the cutter, denying the pass from the Coach. 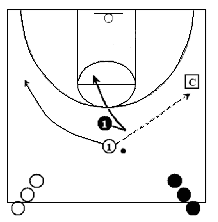 The Coach dribbles to the wing, as the offensive player cuts across the lane to the weakside. The defender denies the back cut, and then assumes a helpside position in the middle of the lane. See man and the ball. Note: Do not follow the cutter out to the weakside wing. 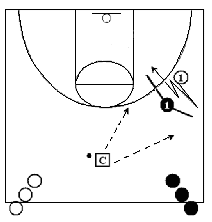 Offensive player dribbles to the top of the key and passes to the Coach then cuts to the basket. Defender moves in the direction of the pass, and then follows the cutter maintaining a denial position. Beat the cutter through on ballside. This drill is the same as the previous. 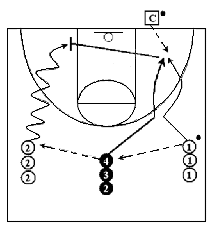 This time offense can cut to the basket in either direction. 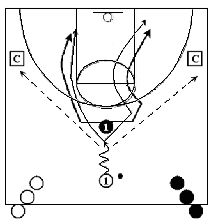 The Coach makes a skip pass to O1 at the weakside wing. O1 looks to shoot or drive. X1 is in a help position, seeing both the ball and player. X1 closes out on O1 with a high hand close enough to prevent a shot. X1 forces the ball to the corner. 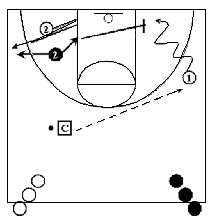 At the baseline O1 passes to the Coach then cuts across the lane. X1 assumes a pass denial position against O1. By using hand and arm in the passing lane the defender does not allow the ball to be caught by the offense. 02 attempts to get open to receive the ball from the Coach while X2 denies the pass. 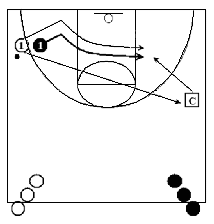 Instead, the Coach passes to 01 at the weakside wing. X2 moves on the pass to a good helpside position. 01 drives to the basket. X2 stops the drive and takes the charge outside of the paint. 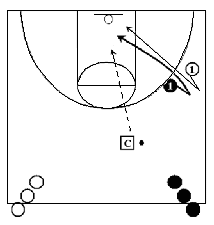 O1 passes to X4 then cuts to the basket to receive the ball from the Coach for the layup. 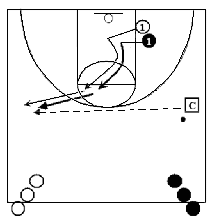 X4 immediately passes to O2 then follows O1 to the baseline to block O1's shot. 02 drives hard to the basket for the layup, and X4 stops the drive and blocks the shot. Note: To improve defender's help-side defense by recovering quickly. 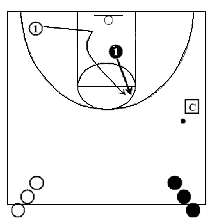 To closeout on the shooter and react to dribble penetration.